← The only failure is not trying!! Yes…You will be missed. 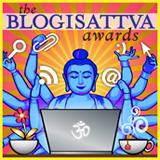 Perhaps we can honor your work by continuing to produce our work, continue to do blog swaps and promoting the dharma.